DETROIT, USA -- It took five years to hunt him down, and about five hours to sentence him. 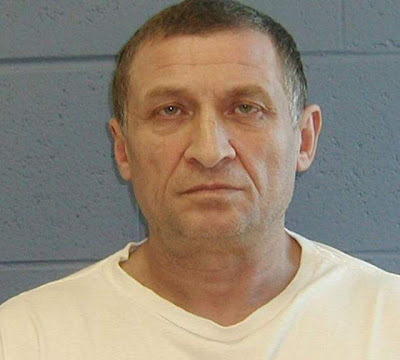 But as of today, the federal government is done chasing Ukrainian nightclub owner Veniamin Gonikman, who was sentenced to three years in prison for his role in an operation that smuggled Eastern European women into the U.S. and forced them to work in local strip clubs. He is the ninth and last defendant to be convicted in the human trafficking case. Gonikman, who led the government on an international manhunt for years, only admitted to money laundering, and insisted there were no "vulnerable victims," that he was never on the run, and that he lived openly in Ukraine. He was pushing for a 10-month sentence. U.S. District Judge Victoria Roberts gave him 36 months instead, still shy of the 51-month prison sentence that prosecutors sought. "From the beginning, it appeared that Mr. Gonikman was involved in the plan to get the women into the U.S.," Roberts said during the unusually long sentencing hearing, which was more like a mini-trial without witnesses. Prosecutors scoffed at Gonikman's claims. “It is difficult to imagine him being fooled by (his son) … The fact of the matter is that Gonikman was not indifferent to the idea of recruiting women from his club to work in the United States … He was an integral part of the operation because he saw it as an opportunity to make an enormous profit off of 'his Ukrainian dancers,’ “ Assistant U.S. Attorney Mark Chutkow wrote in his sentencing memo. • Gonikman, who was once on the FBI’s Most Wanted list, fled the country in 2005 to avoid prosecution in a case in which his son, ex-wife, daughter-in-law and business partner all were charged and convicted. • He tried to change his identity and get a fake Ukrainian passport to avoid capture. • And when he was ultimately arrested in January 2011 in Ukraine, he tried to bribe officials to let him go. Gonikman became a fugitive in 2005 following the arrests of his co-conspirators, his son, Aleksandr Maksimenko, and business associate Michael Aronov, both of whom were convicted and sentenced to prison. Gonikman was not apprehended until 2010 in Ukraine, where he was arrested on an immigration violation. In September 2011, nine months after his capture, Gonikman pleaded guilty, but only to money laundering. In court today, Gonikman’s lawyer Walter Piszczatowski disputed claims that his client was the ringleader, saying Gonikman never controlled any of the money, and that he never physically hurt anyone or recruited anyone to come here against their will. "Yes, he's a businessman. And the court may despise that business, and I may despise that business," Piszczatowski said, noting he has daughters. But his client, he said, "was not a leader," and "he didn't have control over the money." "At best, he's a participant," Piszczatowski argued, saying Gonikman's codefendants ran the show. "These guys are controlling all the dough," Piszczatowski said. During his plea hearing, Gonikman admitted that his son, who was convicted of running the smuggling operation known as Beauty Search and sentenced to 14 years in prison, wired him money in Ukraine. He said that he received more than $160,000 in wages the women earned. Gonikman came to the attention of authorities in Detroit in 2005, when one of his alleged victims escaped. Authorities said that the women were forced to work 12 hours a day and turn over their earnings -- more than $1 million -- to Gonikman. “This sentence brings the final member of this human trafficking ring to justice,” U.S. Attorney Barbara McQuade said. "These women were brought to America with promises of education and travel, and instead forced to work in seedy strip clubs ... After more than seven years ... we are able to formally end this horrific chapter in the lives of the victims and allow them to now move on knowing that justice has prevailed." One victim testified before Congress in 2007 about her treatment. "I could not refuse to go to work or I would be beaten," the woman testified. "I was often yelled at for not making enough money, or had a gun put to my face. "Every week, I handed over around $3,000 to $4,000. I was their slave." When you go to Kiev for a Ukraine vacation, you definitely should visit local nightclubs! Baeutiful girls make Ukraine tourism unforgettable. So joyful atmosphere, so beautiful girls! Ukraine vacation guide created a list of the best Kyiv night clubs. If you know more goog places, you can add them to the Ukraine travel guide.